My name’s Ruth Snowden. I’m a Senior Engineer for VBA, a joint venture between VolkerStevin, Boskalis Westminster and Atkins. We’re working on a multi-million pound Environment Agency project to upgrade Ipswich’s flood defences. As a Senior Engineer my role is to move sections of the project along towards completion. I look at the design drawings and the programme of works and use the information to make a plan. This involves everything from how to access parts of the site - on this project lots of areas are flooded by the tide at certain times - to ensuring I keep accurate records of what has been built. Of course, a lot goes on in between those two points. Foreseeing and solving the problems we might encounter is a huge part of what I do. It keeps me constantly evaluating and improving my plans, so every day is different. Most recently students from Suffolk New College, Stoke High School and Westbourne Academy, all in Ipswich, have visited the site to learn about the how the scheme was planned, the various stages of development, the logistical challenges and the skills needed to work on such a complex project. Large scale projects like this don’t come around too often so this was a great opportunity for the students to see the kind of work they could be involved in one day. Community work aside, we’ve also made great headway on the barrier scheme. In the last blog post Andrew Usborne, our project manager at the Environment Agency, talked about the work we’re doing to prepare for the installation of the barrier. The erosion protection piles he referred to have now been completed. These will help to protect the existing river wall from being undermined by the tide during construction. 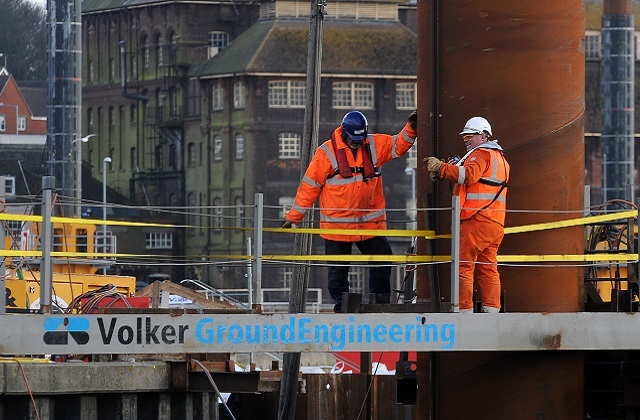 In addition, a 400 tonne crane is now on site which can reach out to the further points of the river walls. Installing such a heavy piece of kit required plenty preparatory work involving crushed and compacted stone, several specially placed sheet piles and steel mats. The river channel is also being dredged. This will ensure the river can flow freely past the works and create a safe navigable channel allowing the existing boat traffic to access their moorings during the works. To carry out the dredging a large excavator has been put onto a pontoon in the river which is removing river bed material, such as silt, and placing it in a hopper on the pontoon. From there it will be pumped into geotubes, special sausage like tubes that let the excess water drain away. The dredged material will then be processed to remove any contaminants before it is used for filling in the newly reclaimed land to the west of the new gate structure. During summer 2016, you’ll really start to see the changes as we build the cofferdam, a temporary watertight enclosure in the middle of the river channel, which will be pumped dry to allow the concrete works for the gate to be constructed. We'll keep you updated.